Please allow a one-hour drive from San Jose. The road is good, but windy. There are no automative services or gas stations for 20 miles, so please plan ahead. Take extra precaution driving up to the observatory: mud slides, rocks and gravel or debris can cause hazardous road conditions. Also, please look out for motorcycles and bicyclists and drive conservatively. You can check for possible road closures on the CalTrans website here before you make a trip. Consider taking Quimby Road as an alternative route to get to the observatory. View more details on driving directions and parking information here. The Gift Shop & Visitor Center are open year-round. Admission is free. The Shane 3-meter visitor gallery is open every day from 10 a.m. to 5 p.m. Please note: Vending machines, water fountain, and restrooms are open in the main building seven days a week, from 8 a.m. to 5 p.m.
We recommend that groups of 20-25 people use a small shuttle bus for transport up to Mt. Hamilton. Large buses are not recommended on Mt Hamilton Road or San Antonio Valley Road, as it is very difficult to navigate some of the tight turns. 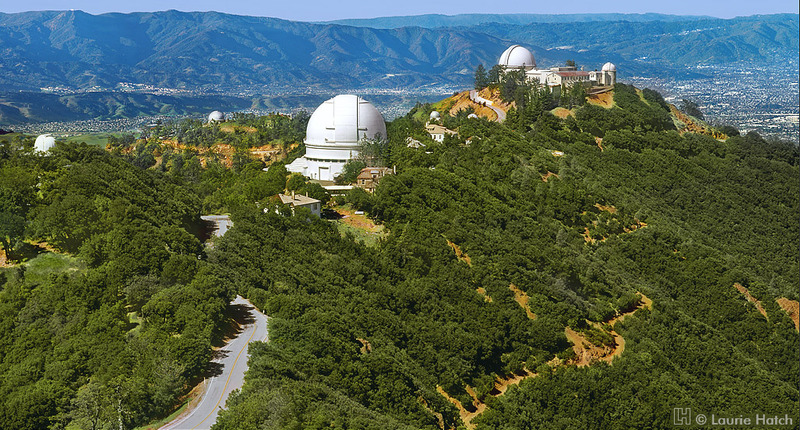 Make your trip to Lick Observatory a memorable one with our recommendations. View exhibits in the main Observatory building, built in 1888. Note the original oak and marble interior. Enjoy a short informal talk about Lick history while taking a look at the Great Lick Refractor in the 36-inch telescope dome (no charge). Talks begin at the Gift Shop, throughout the afternoon starting at 12:30 p.m. continuing until 4:30 p.m., Thursday through Sunday. At the Gift Shop check out Lick Observatory sweatshirts, T-shirts, mugs, astronomical photos, posters, educational toys, and other astronomy-related goodies. Take a short walk to the Shane Dome to view the 120-inch Reflector from the Visitors’ Gallery (open daily from 10 a.m. to 5 p.m.). Displays explain the Shane reflector, one of the major telescopes used to discover extrasolar planets. Enjoy the view of the Santa Clara Valley from the parking lot at 4,209 feet. Bring a picnic lunch to eat, or grab a snack or soda at our vending machines. Guests are permitted to visit Lick Observatory at night by purchasing a ticket to the Summer Series from June through September. Please do not visit the observatory at night without a ticket to one of our evening programs. Lick Observatory is an active research facilitiy, and at night all of the buildings are locked and astronomers are working at the darkened telescopes. Telescopes require the darkest possible conditions to detect the faint light from celestial objects.The success of our work relies upon minimizing lights around the observatory at night. Thank you. The observatory is more than 20 miles from downtown San Jose along Mt. Hamilton Road at an elevation of 4,200 feet. The road follows a gradual grade laid out over a century ago for horses and carts. It has many sharp curves and is quite narrow in places. At 4,209 feet, weather on Mt. Hamilton may be cool and changable, so bring a sweater or coat. We do have wheelchair access to the main building from the back. During the winter the road may be closed temporarily due to snowfall. For current road closure information, Visit the California Highway Information website and enter Hwy #130. All unmanned aircraft systems (UAS) flights at Lick Observatory require prior approval and post-flight reporting. The use of all unmanned aircraft systems (UAS) on Lick Observatory owned property must be reviewed and approved prior to flight. This policy applies to all visitors, faculty, staff, students, and university contractors, as well as indoor and outdoor use. Please contact Lick Observatory Superintendent Kostas Chloros if you have questions regarding UAS at Lick Observatory.